We would love to have another child so Montessori infant rooms are still very much on my mind. If you are preparing for the birth of a baby or setting up an infant room here are a few ideas and suggestions. The child is in the Symbiotic Period (the first 6-8 weeks). The child spends most of their time feeding or sleeping and for me, the focus of this time was building a relationship with my infant. While the environment is still important, my focus was on caregiving, handling and getting to know my little one. During this period I held my children close, building trust through feeding and caregiving, by using a baby carrier (I used the Ergo Carrier), talking, singing. Although I also allowed my children freedom of movement, still giving them independence and lots of time to stretch and wriggle on the floor. We still prepare the environment to meet the developmental needs of the child and observe them closely! The child develops so fast during this period. A Floor Bed, many Montessori parents use a Moses Basket, co-sleep (or use co-sleepers) or use a Cestina. Sleeping arrangements are personal, while co-sleeping isn't necessarily endorsed by the Montessori community it is an option some parents take. SIDS recommendations are important and recommend infants sleep in the same room as an adult for the first six to twelve months. If you decide to use a crib for this stage I still encourage you to explore the floor bed as an option for the future. Topponcino (this is the thin, oval mattress pictured on the floor bed). The purpose of the Topponcino is to allow the infant to be safely, warmly and securely held. They can be held by siblings or transferred without being disturbed or woken. The aim is for the child to feel comfort and secure in their environment. Black and white images for the child's developing vision and concentration, these can be cards on the wall or in books. They can be placed in care giving areas for example next to a change table or in movement areas. Low shelving. Although the child isn't moving far they will begin to map their environment and begin to learn where their toys are stored. It's a good idea to place the shelves in the same position they will stay when the child is older. Developmentally appropriate materials and toys such as rattles for when the child is ready. Books are good for reading to the child. Low hanging artwork will assist in making the room feel warm, comforting and having interesting images to look out can be useful for language development. Movement mat or play area, wall mirror and visual mobiles. The movement area is important for the young child. I also used a soft blanket that I would move from room to room so the child could be near me, where I was working but didn't need to be held. A soft blanket on the floor or lambs wool rug can be beneficial over a Moses basket as the child has greater vision and can easily observe their environment and will begin to move around. The child will begin to see their reflection in the mirror and will over time develop coordinated movement. A child of this age (closer to three months) may be ready to use a rattle, a small play-silk or grasping beads. These can be placed near the child and they will begin to reach, move towards the materials and possibly grasp. Ensure the wall mirror is placed low to the floor so the young infant can look in it when lying down on their back. 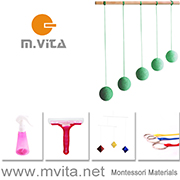 Visual Montessori Mobiles are used during this period and vary to the child developing vision and concentration. It's nice to open a window or provide just a little breeze so there is some movement in the mobiles. We use the mobiles above the child's work area not above their sleeping space, unless the mobiles are easily removable or can be put to one side. The visual mobiles should be positioned above the chest area so the child can see them when looking forward but cannot reach them. The Munari Mobile is a classic black and white mobile used from around two weeks, other Black and While mobiles may be useful at this stage, Octahedron Mobile is introduced around six weeks and introduces three coloured shapes, Gobbi Mobile, as pictured, introduced at around eight weeks, the mobile has five spheres which are coloured, Dancers Mobile at around ten weeks. We used the Bell on Ribbon and Primary Colours Mobile which are tactile mobiles (the child will start to reach for and bat at) around three months. Other mobiles such as a Butterfly Mobile can also be a fantastic material for the infant. The key to using the mobiles is to observe the child and their interaction with the mobile to determine when it is time to move onto the next mobile according to their developmental needs. 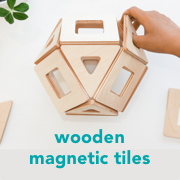 There is further reading about all of the Montessori mobiles here. Topponcino, Black and White Infant Cards, Black and White Books, Mini Play-Silk, Grasping Beads, Crochet Rattle, Bell Rattle. Mobiles (can be handmade or check Etsy), Butterfly Mobile. Recommended reading for this age group includes; Understanding the Human Being, Montessori from The Start and The Joyful Child. You may also be interested in reading about the Montessori Infant Room at 3-6 Months - An Overview here and you can read our favourite books for babies here.